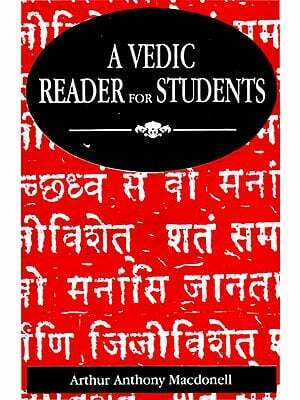 ‘Lectures on Vedic Language’ as its title indicates, is a collection of three lectures, delivered by Prof. B.B. Chaubey, an eminent Vedic Scholar, under the Wilson phi logical endowment Lectures’ at the Deptt. Of Sanskrit Pali & Prakrit, University of Bombay. The first lecture deals with the nomenclature, nature and various linguistic peculiarities of the Vedic Language. 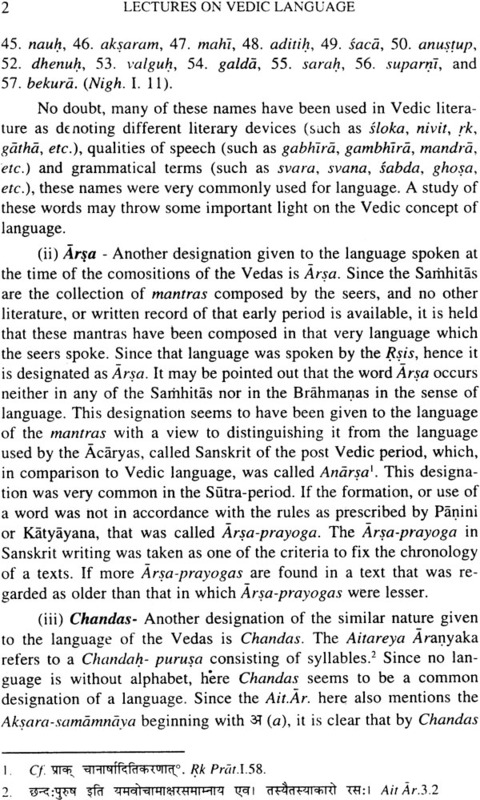 The Indian tradition frequently uses the terms’ Vak, Arsa, Chandas, Arya, Anvadhyaya, as various appellations of the Vedic language. The historicity of these appellations has been discussed for the first time here. 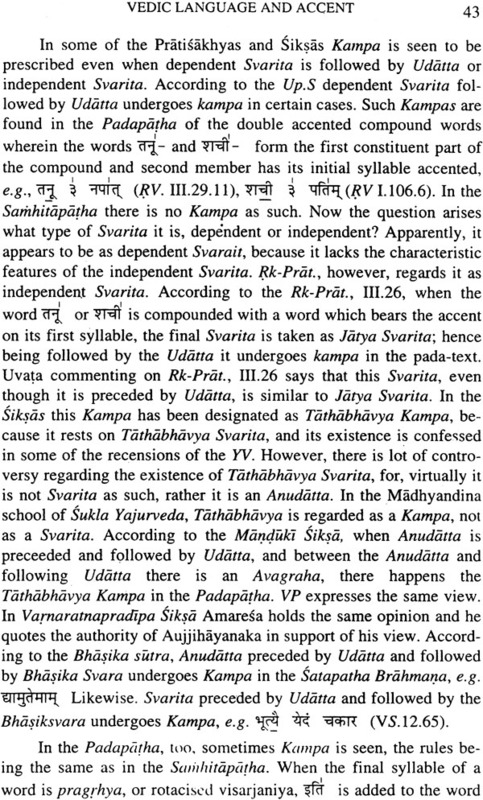 As to the nature of Vedic language various theories have been proposed by many Western scholars, Among these ‘theory of Dravidaism, theory of Prakritism and the theory of contemporaneity of Vedic language with Avesta have been much discussed and it has been conclusively established that the Vedic language is the most ancient language of the world, hence the question of Dravida, Prakrita and Avesta languages influencing the Rgvedic language does not arise. These theories have been conclusively rejected. The second lecture deals with the phonetic variations in the matter of pronunciation of various sounds which had developed in course of time with the appearance of many Sakhas of the four Vedas. Treatments of nasal sounds were quite peculiar in different. The third lecture deals with the Vedic language and Accent with detailed discussion on accent logy and Accentography. Born on july 1, 1940 at vill & Po. Jawahin, Ballia (u.P.) Fourth son of shri narayan Choubey and Smt. Anjoria Devi. Primary and middle education village school ; matric and intermediate from R.S. Kisan Higher secondary school, Dubahar; B.A. (1959), M.A. (1961) and Ph.D.(1964) from B.H.U. ; sahityaratna (1960) from Hindi sahitya Sammelan Prayag. Served at Institute of Oriental Philosophy, Vrindaban (1965-66) and VVBIS & IS (P.U.) Hoshiarpur as lecturer, Reader and Professor-Director (1967-2002); Visiting Professor at MDS University, Ajmer (May 1, 1998-April 30, 1999). I deem it a privilege to have been invited by the University of Bombay to deliver a series of three Extension Lectures on Vedic language under the ‘Wilson Phi logical Endowment Lectures’ at the department of Sanskrit, Pali and Prakrit, on February 18-20-1991. 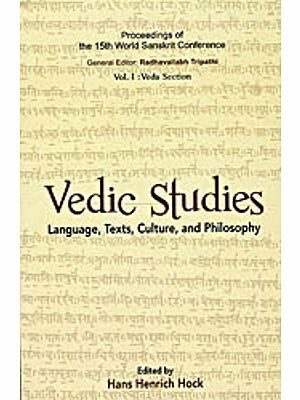 Veda being the most ancient literature of the world its language too, in which the Vedic seers ever expressed their intuitive knowledge to the mankind, was the earliest form of language, known to us so far. It was spoken throughout the sapta sindhu Pradesh, the cradle of Aryan culture. At that time a vast literature, known as mantra, came into existence in that very language of the seers. In course of time the same language took various shades, as no language, by nature, can remain even static. In course of time, a vast literature known as the samhitas, the bramanas, the Aranyakas and the upanisads came into existence, showing different linguistic shades in phonology morphology and the syntactical uses, due to both kala-bheda and desa bheda. Keeping the entire above mentioned Vedic literature under my purview for the lectures on Vedic language I chose upon following three topics for my lectures. I. Vedic language: Nature and Scope. II. 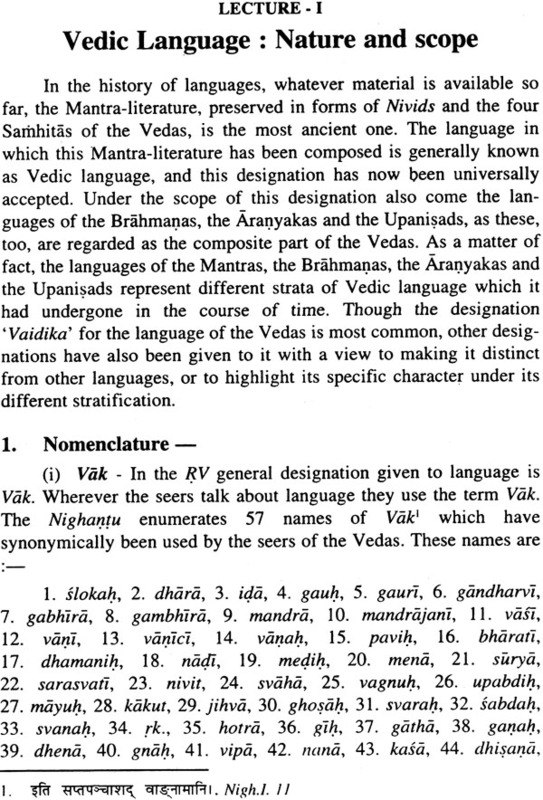 Linguistic variations in Vedic Language: with special reference to Vedic Sakhas. As per practice, the extension lectures are generally published by the inviting organisation, but due to a limited amount of fund sanctioned for the purpose, the Deptt. Of Sanskrit, Pali and Prakrit, University of Bombay could not publish them. These lectures remained unpublished for a long time, as I, too, was awfully busy in publication of my critical edition of the Vadhula-Srautasutra(1993), editing of ‘Sanskrit Vanmaya ka brhad itihasa’ Vol-I ‘ Vedakhanda” (1996), and many other academic works one after another Now I feel great pleasure in presenting a revised version of those lectures in book form in the hands of scholars and general readers interested in Vedic lore. In the third lecture dealing with ‘Vedic language and Accent’ I have added some more materials regarding Kampa Svra, which were not given in the lecture. In preparing these lectures I have consulted works of various scholars working in this field and have cited from them either directly or indirectly. In this regard I would like to make special mention of the articles, viz., ‘About traces of a Prakrit dialectal basis in the language of the Rig-Veda’ by T.Y. Elizarenkova, ‘Avestique et dialectology RGvedique’ by Eric Pirarrt, ‘ReflectsDialectaux enVedique ancient’ by georges jean Pinault and “Tracing theVedic and ‘Tracing the Vedic Dialects’ By Michael Witzel, all Published in dialects Dans Les. 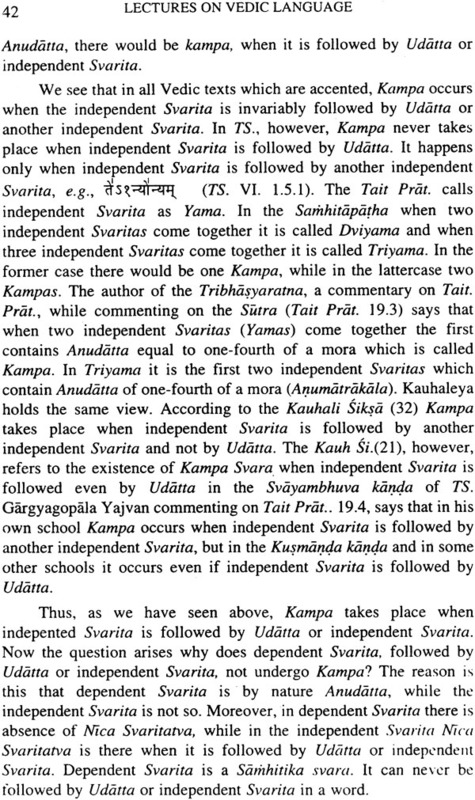 Literatures Indo-Aryannes, from institute de civilization Indienne Paris, 1989. I am sincerely grateful to all of them.